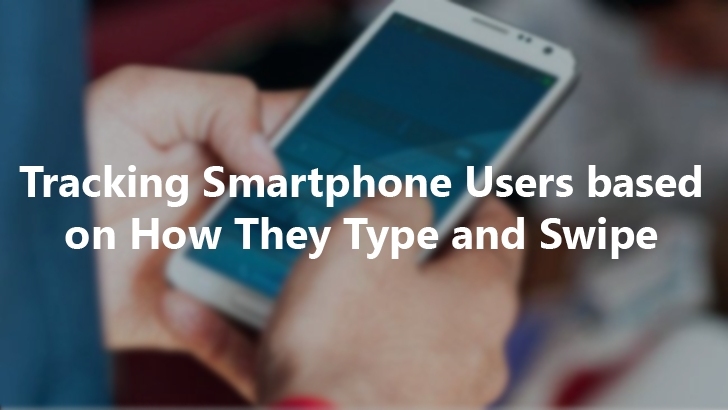 Just the way you swipe your smartphone screen is enough for your smartphone to identify you. Yes, it’s a Fact, not Fiction! The United States National Security Agency (NSA) has a new technology that can identify you from the way your finger swipe strokes and text on a smartphone screen, according to officials with Lockheed Martin who helped design the technology. John Mears, a senior fellow for Lockheed IT and Security Solutions, told NextGov that Lockheed Martin has been working with the agency to create a "secure gesture authentication as a technique for using smartphones," and "they are actually able to use it." This new smartphone-swipe recognition technology, dubbed "Mandrake," remotely analyses the curve, unique speed and acceleration of a person's finger strokes across their device's touchscreen. "Nobody else has the same strokes," Mears explains. "People can forge your handwriting in two dimensions, but they couldn’t forge it in three or four dimensions." "Three is the pressure you put in, also to the two dimensions on the paper. The fourth dimension is time. The most advanced handwriting-type authentication tracks you in four dimensions." Mandrake is similar to Dynamic Signature – a motion recognition technology originally developed by the US Air Force in 1978 for Pentagon to capture the behavioural biometrics of a handwritten signature. NSA wants to give more accuracy to users. Oh! Really? The NSA has tested the smartphone-swipe recognition technology in an attempt to move past the age of passwords because the technology is expected to be more accurate than the use of passwords. The United States spy agency is keeping mum on how the NSA might use the new technology though Mears says that the organization can actively deploy the technology right now, and could already be exploiting it as part of its creepy bulk data collection program. So, it has yet to be known how NSA make use of this new technology to add up to its Global surveillance program to spy on innocent people. The latest revelation comes this week that the agency planned to hijack Google and Samsung app stores to infect smartphones with Spyware to secretly collect data from the devices without their users knowledge or confirmation. There aren’t many details about the technology available yet, but it is believed that the technology potentially could be used for emergency responders or mission-critical personnel, who often don't have the time or capability to get online for reporting purposes. "If you are going 100 miles down the road, you are not going to enter a complex 12-character password to authenticate yourself," Mears says. "We have some customers who deal with radioactive material and they cannot touch things that small with gloves on – how do they authenticate?" However, the NSA is not the only United States agency who is looking for improvements on the password for smartphone device security. Recently, the Federal Bureau of Investigation (FBI) has spent $1 Billion on a program – called the Next Generation Identification (NGI) system – which has the capability to recognize faces, fingerprints, palm prints, tattoo images, and retinal scans. NGI system is also developed by Lockheed and in future may incorporate voice and "gait" recognition to identify how a person walks.